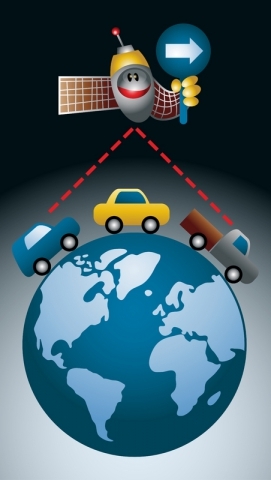 GPS Tracking Solutions: How Does GPS Work? How often do you pull out your phone, open up your favorite maps app, and look up directions to your friend’s house, the mall, or maybe even more often, find out where you are in the first place? Even though not so long ago, we had to rely on actual paper maps to navigate us to where we want to go, it’s as easy as a couple taps on our phone and we’re on our way. GPS tracking solutions have come a long way, even being able to help us locate where a package is or help us navigate our way to a local restaurant. But what is actually happening when you open the maps app and the small arrow pops up, showing where you are? How does it know exactly where you are? And even which direction you’re facing? Well, let’s find out. Basically, satellite navigation uses a portable radio receiver that picks up on the speed of light signals that come from satellites that are orbiting around the Earth. With these signals, you can determine your position, speed, and local time. Satellite navigation is much more accurate than other methods of navigation, which often have to put up with weather conditions that can get in the way of signals. GPS (Global Positioning System) is the best-known satellite navigation system. If you look up into the sky on a clear night, you’ll undoubtedly see an innumerable amount of stars, an airplane or two maybe, and an object gliding through the sky that gives off a flash of light every so often, but is moving much slower than an airplane. These are active satellites. 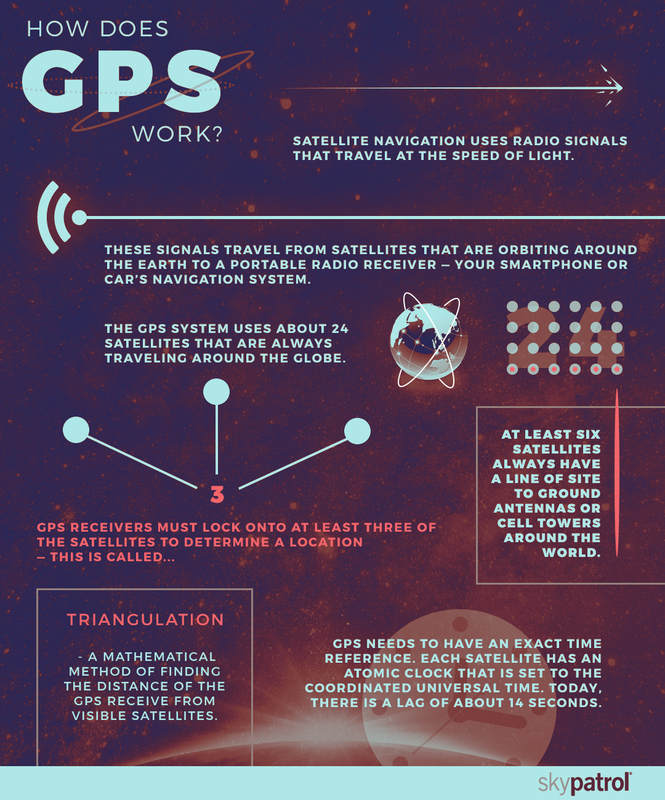 The GPS system uses about 24 satellites that are always traveling around the globe, whether you can see them or not. These satellites travel around the Earth every 12 hours, but you can find your location with only three or four satellites. The radio receiver, or phone most commonly, in your pocket. There is also a network of ground-control antennas, monitors, and control stations that the system uses. Think of a Venn diagram, with three overlapping circles. If you’re walking in the middle of a city, but you don’t know where you are, you can use landmarks in your view to help you determine your location. To your right, if you see a tall building you can recognize, you can guess how far away you are from that building. On your left, if you see a train station you’re familiar with, you can guess how far away you are from that. With these two landmarks in your view, you can estimate your general location. If you can locate a landmark behind you as well, this will give you even more information about your exact location. This, in essence, is how radio signals, radar, and space satellites can determine your location and possibly even altitude. GPS first began in the military, when they needed a higher accuracy for aircrafts and submarines. Civilians who wanted to use GPS had limited capabilities and could only provide a location within 100 meters. If you’re trying to find your way to a hotel in a crowded city, a 100-meter range leaves a lot of guesswork on your part. After a certain time, civilians were given improved GPS tracking solutions and could find their location within about 15 meters, or two to three car lengths. So when your car tells you to “take the next right,” you can rely on that information. Other than getting directions from your car’s navigation system, there are plenty of other uses. GPS tracking solutions could someday be able to help us find parking spots, help solve traffic jams in busy cities. GPS is already helping companies defend against car theft. Farming can also be taken up a notch. GPS can be used in tractors and combines to help manage their planting and harvest. The system is helping pet owners find their lost dogs or farm animals. The blind can easily navigate through tricky locations with GPS that talks them through directions and can even warn of present dangers. This compact GPS tracker can give you a location on demand, it reports battery voltages, provides speeding notifications, it has automated reporting modes, and more. This is the perfect option for tracking field personnel, seniors, children, or employee movement. It has a smart SOS button, low battery notification, and 3-axis accelerometer. This will meet a majority of your installation, connectivity, and performance requirements. It has three digital inputs, one analog input, and three digital outputs. It is incredibly sensitive and has a splash-proof housing. The latest generation of GPS tracking solutions, this will meet all carrier and country certifications. It is designed to withstand the harshest conditions and has a range of applications. Air Patrol seeks to provide the most innovative technology and GPS tracking solutions for fleet management. Whether you’re a distribution company or own a local sales operation who visits potential customers, when you want to track, monitor, and protect your fleet, you need the best hardware and software. Learn more about how Air Patrol can help and get in touch today with any questions.